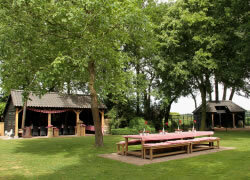 Our typical Brabant's long gable farmhouse is located along the road between Asten and Lierop. By car it is easy accessible, using the highway A67 with exit 35. We are also ideally situated if you decide to come by bicycle as we are located along the nodes route, between nodes 90 and nodes 41. 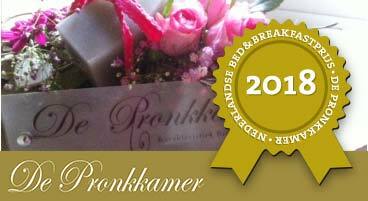 Also the long distance cycle route LF13a (Rijn-Schelde-route) passes our Bed & Breakfast. The rooms of our Bed & Breakfast are accessible via their own entrance and are situated in the original living part of our farmhouse. Two guest rooms are situated on the ground floor. The third spacious guest room you find on the first floor. When entering the farmhouse and your room you will come across many authentic features. Breakfast is served in our country kitchen. 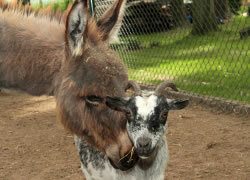 If the weather is nice you can also have your breakfast in our pretty garden with animal shelter. After a strenuous day you can delightfully withdraw in your room, use the (infrared) sauna or find a beautiful spot in the garden to read a nice book. There are several terraces and you can also play boules in our garden. The spot under the nut-tree is a lovely place to be during warm summer days. During the months that the evenings become longer, it is nice to sit by the hearth. 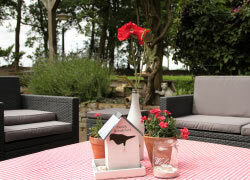 Bed & Breakfast Hoeve Nijssen is located in the country area between Asten and Lierop. Asten is surrounded by green. In the neighborhood you find the nature reserves “Nationaal Park De Groote Peel” and the “Strabrechtse Heide”. In these reserves you can cycle and walk nicely. 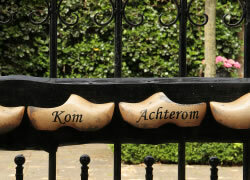 Asten also has several museums and sights. Everybody knows Asten because of the Koninklijke Eijsbouts’s bell foundry. Logically you find here the Carillon museum. For the young and the old it is also worthwhile to pay a visit to the Nature Historical Museum De Peel and the Observatory. Formerly the Peel extended over the Brabant’s villages Zeeland and Mill in the north up to the southern villages Nederweert and Heythuysen in Limburg. These days the Asten’s Peel and the Ospeler’s Peel are leftover. This national park “De Groote Peel” is located at the south border of the municipality in the hinterland of Asten-Heusden. 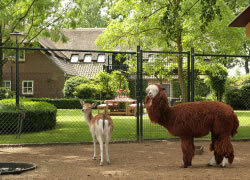 A visit to the visitors centre Mijl op Zeven is a good start to get acquainted with this beautiful area. From Bed & Breakfast Hoeve Nijssen it takes about one hour cycling to get to this visitors centre. You can find the Strabrechtse Heide behind the village Lierop, which takes half an hour cycling from Bed & Breakfast Hoeve Nijssen. It is a beautiful nature reserve of 1500 hectare of heather. You will enjoy the surroundings and perhaps you might come across the herd of 300 Kempen’s Heather sheep along the way. There are plenty of restaurants, cafes, pancake restaurants etc. After all you are situated in a very hospitable part of The Netherlands. With much pleasure we like to show you the way.